I know, I know, it's a long walk (about 2000 km /1240 miles). It took us two and a half month. We started July 1st 1994 at the Sint Pietersberg in Maastricht. Because there was a gap between the book we had of the Pieterpad and the map of Belgium, we made a mistake and took the wrong way. Not completely wrong, but not the way marked route. This was the first of many mistakes. It was a very hot day, over 35°C (95°F). Because there are no campsites between Maastricht, we spent our first night on the GR5-E2 on farmers' land after asking for permission. The next days we walked from Spa via Stavelot and Vielsalm to Burg Reuland. 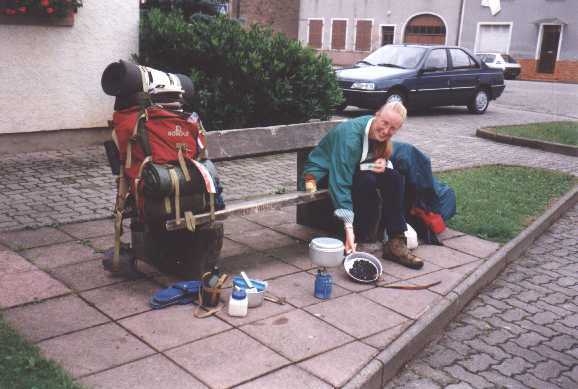 At the campsite of Stavelot we met a fellow hiker, who walked solo from Holland to Lyon along the GR5 and GR7. Our last day in Belguim we made a serious mistake again. And believe it or not, the reason was the same as the first time; there was a small gap between the map of Belgium and the book Du Luxembourg aux Vosges. From Grüfflingen to Burg Reuland we walked via the old route marked on the map and back via the new route using the way marks in the field. So after a four hours walk we were back from where we started. After this disappointment we hitch-hiked to Tintesmillen in Luxemburg. Next day we met the solo walker from Stavelot again and decided to walk together for the rest of the day. In Vianden (date July 10th) we took a day off to wash our cloths and the solo walker went on, so this was the last time we saw him. 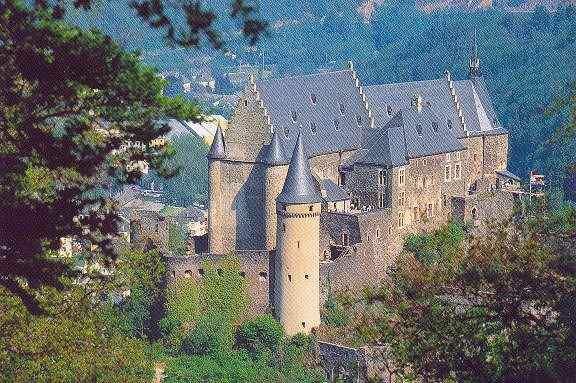 During the afternoon we payed a visit to the castle of Vianden. 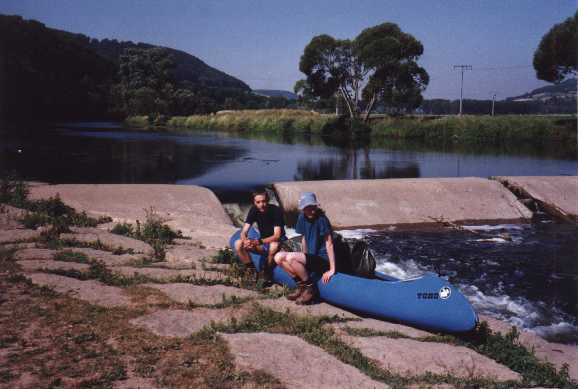 Next days we walked to Diekirch and sailed by Canadian kayak to Echternach. During that sailing trip we both got serious sun-burn, so next day we had to wear trousers and long sleeved shirts although it was quite warm. From Echternach we continued our tour by foot via Born, Grevenmacher to Bous. This part of the GR5 follows the Sûre and from Wasserbillig the Meuse and it goes uphill to actually nothing and downhill to the river again. Because we were told that next part of the GR5 was not interesting and because there were hardly any campsites along the GR5 south of Remich, we decided to skip this. So from Bous we took the bus to Luxembourg city and the train to Bettembourg. Next day we hitchhiked to Nancy (France). We payed a visit to the center of Nancy. A lovely center with a beautiful square surrounded by golden fences. From Nancy we took the bus to Vic-sur-Seille. Here again we took a day off to wash our cloths (date July 17th). From Vic-sur-Seille we continued our tour by foot again via Rhodes, Gondrexange to St. Quirinne on the foot of the Vosges though rather flat land. In the village St. Quirinne we prepared our dinner, because we have planned to wild camp the night and did not want to carry a lot of water uphill. While preparing our dinner a passant offered us some bilberries for dessert for free.